I’m Larry DeVilbiss serving with Global Recordings Network USA (GRN). I was raised on a homestead up in Alaska and so that’s always been home. I’ve been involved with helping recording projects here in Alaska as well as in Siberia and South America. One of my favorite stories is about the Iñupiat in Alaska. We were approached by Molly Pederson who was very concerned about the younger generations losing the Iñupiat language. She came to us and asked if there was a way that it could be recorded and put on video along with subtitles in English. Her hope was that their young people could hear the language, see the English, and the video would then become a teaching tool. Along with GRN recordist Dan Rulison, we told Molly that we would do everything in our power to make it happen. So, I received some training, we prepared the script and planned to have the translation accomplished with Molly’s help. 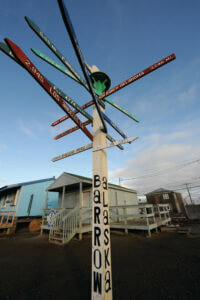 Barrow, Alaska, the northernmost city in the US. She flew out of Point Barrow, the farthest northern community in the United States, to translate the scripts and make the recordings during one of her annual trips to The Native Musicale. During a performance at The Native Musicale, she announced that their language would not be snuffed out and claimed the verse Isaiah 42:3, as a promise for their culture and language. This verse has become the motto now for our recording projects for other languages in Alaska. The location we used to record and videotape was the very same cabin that Joy Ridderhoff, founder of Gospel Recordings in 1947, had used to make the very first recordings in Alaska in the Dena’ina language. Using the video with subtitles was pretty significant for GRN. Working with so many dying languages in Alaska, and those languages not much in use anymore, we’re able to use the videos as teaching tools to keep these languages alive. We anticipate in the very near future being able to produce the same Dena’ina language using this same video format running subtitles. And, we’ve been told that the Dena’ina language recordings will be integrated into the University of Alaska curriculum as a language learning tool. There’s a lot of different ways that Global Recordings can be used, and we’re glad that we found a new one.